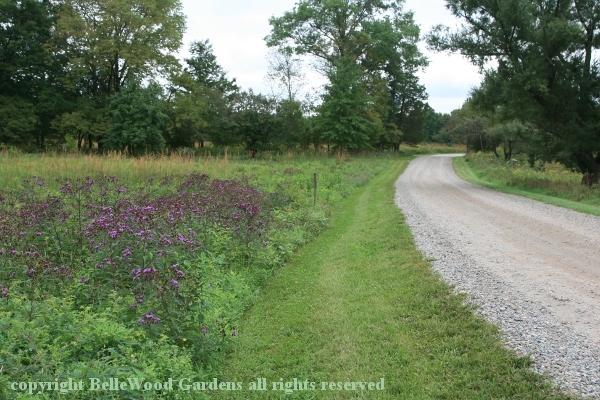 I got an e-mail from John Beirne a couple of days ago, in which he "wanted to tell you that the gardens at Willowwood are peaking now and we are flush with color, fragrance and wildlife. I hope you can steal away for a visit!" When the director of Willowwood Arboretum tells me that it is looking rather splendid, well, behooves me to clear the decks and find some time to make a visit. Accordingly, after the meeting of the rock garden society's local chapter on Saturday morning I happily managed to detour for a couple of hours to see for myself. 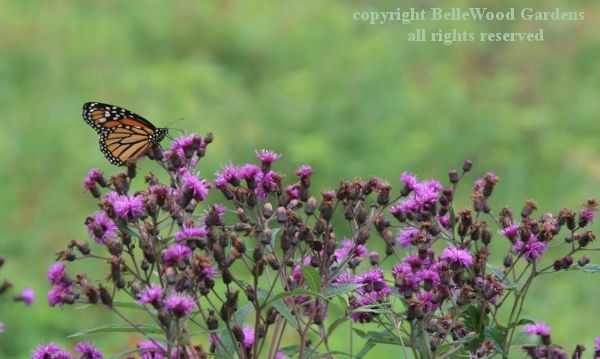 deep purple ironweed, Vernonia novaboracensis, are richly in bloom. emerged from their jade green, gold embellished, pupal cases. 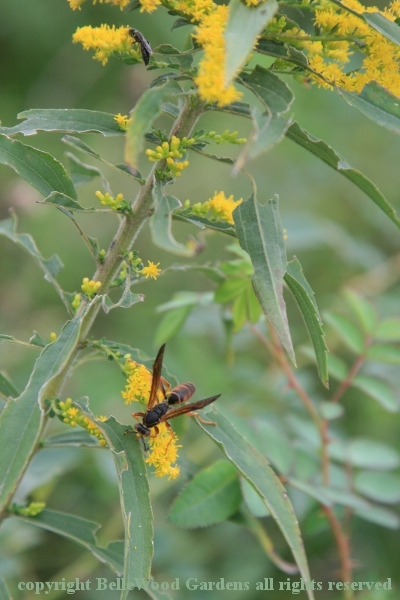 Nor was the goldenrod overlooked. 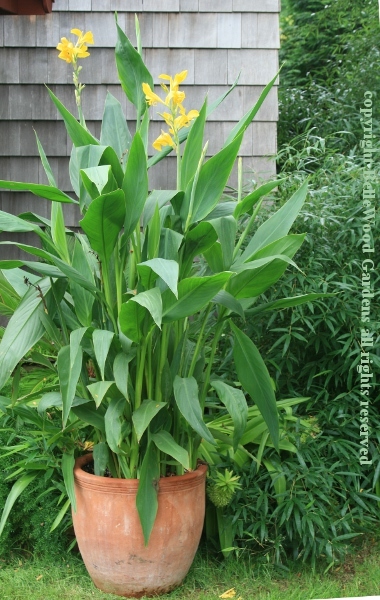 using Canna glauca 'Ra', one of the four Longwood water cannas. 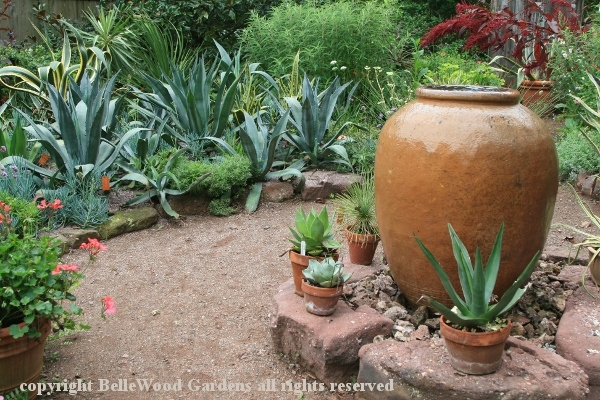 John has always been fond of lush tropical plants with bold foliage and colors other than green. Where better to show them off than in the more public, more "cultivated" areas of Willowwood, near the buildings. 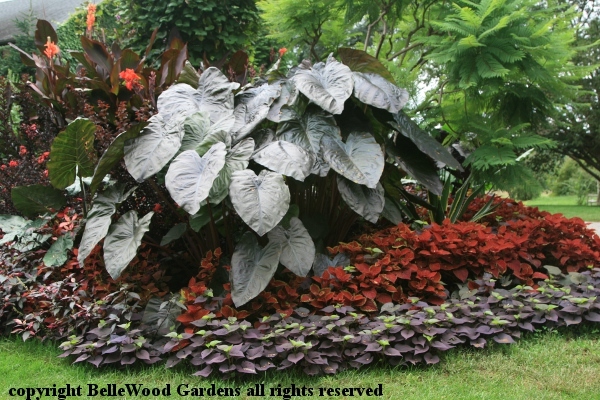 Consider this bed of red flowering, purple leaved cannas on the left, anchored with an elephant ear so dark and shiny it reflects the light. Could it be 'Painted Black Gecko'? Maybe. 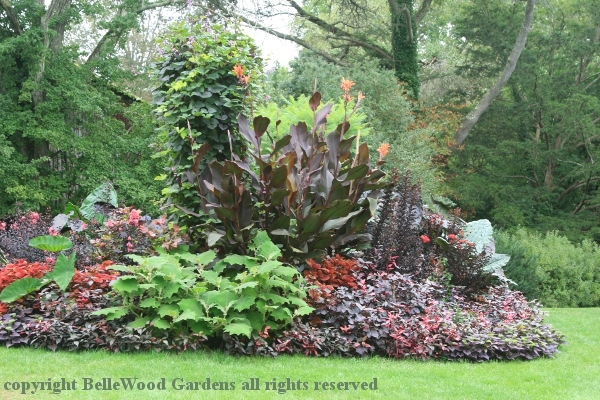 Finish the display with a tutu of red coleus and a ruffle of Ipomoea 'Ace of Spades'. Simple color scheme effectively carried out. The fuzzy looking plant slightly left of center is Solanum quitoense, called naranjilla in Ecuador and Panama. 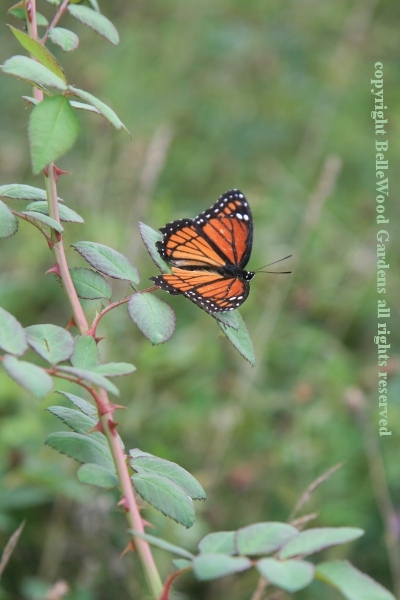 Yes, "little orange" does have edible fruits, even though it is a member of the nightshade family (but so are tomatoes, potatoes, and eggplants.) 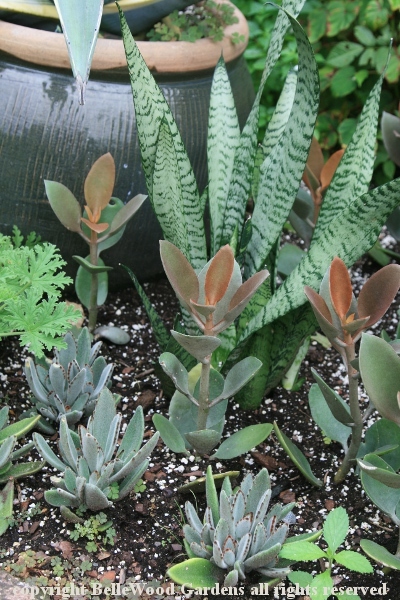 Keep your fingers to yourself, though, the fuzzy look is deceiving - its leaves are quite prickly. lean in to the path to greet you in colorful welcome as you stroll along. 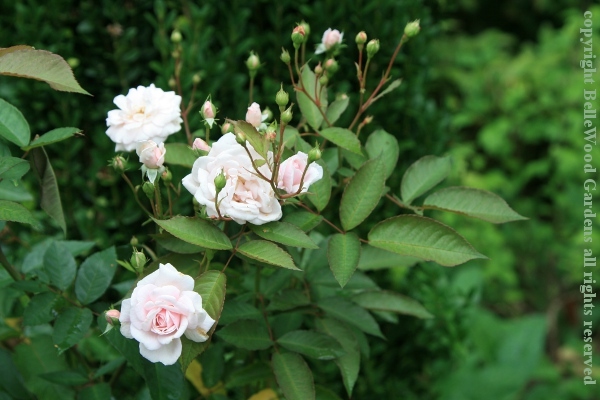 A deliciously pale pink rose offers a swooning cluster of flowers. Follow the road, keeping left and passing the house and its attached little greenhouse. Go passed the large barn or equipment shed or whatever. Bear a little to the right up the slope, and there's another garden. a pithoi as a focal point at the end of the path. Shall we go take a look? having become a fountain. 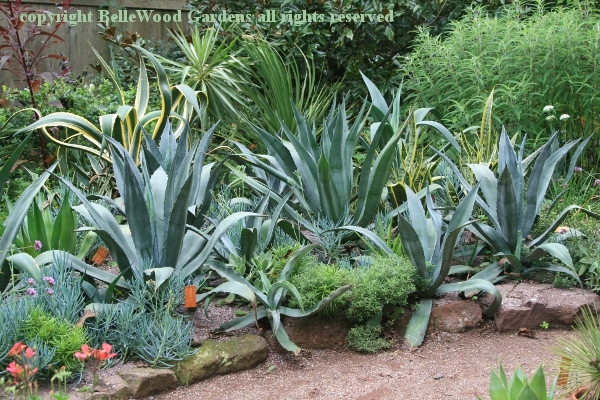 Off to the side are blue-green agaves. 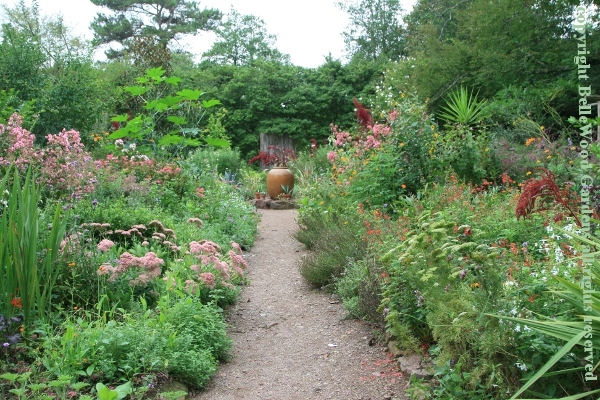 As an aside - there's more garden decor to admire, here and there around the grounds. They look quite cool, in both senses of the word. 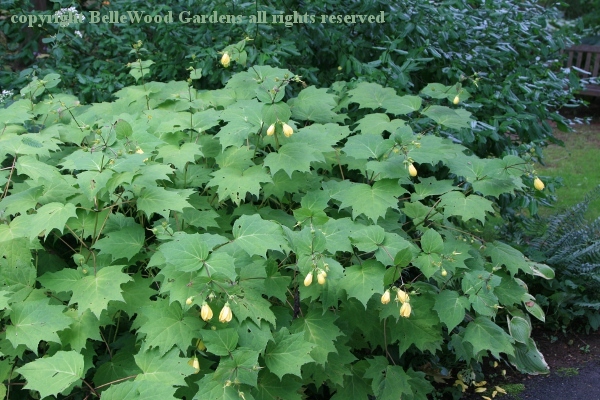 At the back of the densely planted border there is a charming little fruiting tree. It's the hardy orange, Poncirus trifoliata. The fruits will turn yellow when mature but there's not much to use them for - a thick rind and what little flesh there is, is dry and mealy. 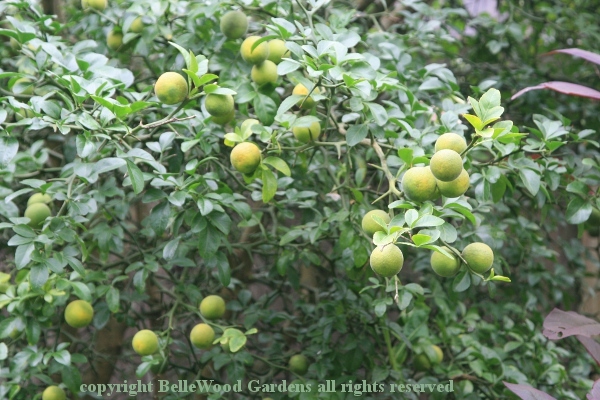 But the idea of growing an orange tree, outdoors in New Jersey, that's good enough to grant it space in the garden. 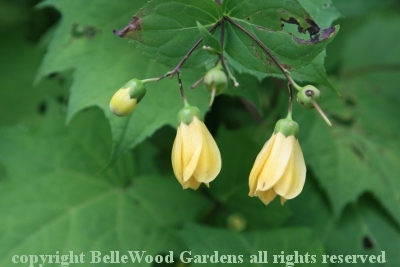 Not all herbaceous plants here at Willowwood are tender tropicals that need to be dug and brought indoors once colder weather arrives. Consider this late summer flowering beauty from Japan. Kirengesholma palmata. If it has a common name I'm unaware of it. Shade loving, in growth it gives the appearance of a shrub but is herbaceous and will die back to the ground in late autumn. should chime, but it must be music for the fairies. There is a special day this weekend, when Fall arrives. 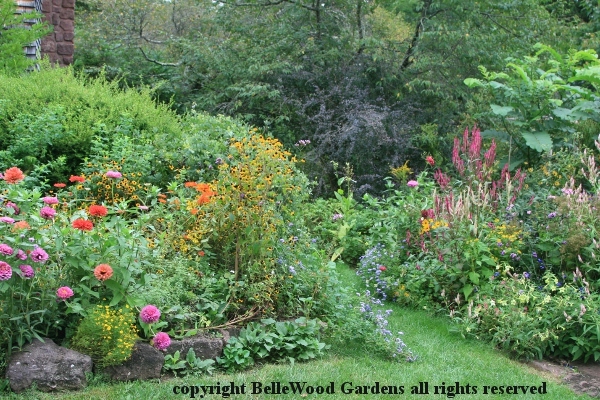 On Sunday visitors can enjoy the meadows and late summer gardens at the Willowwood Fall Open House from Noon to 4 pm. The Tubbs House will be open and there will be both horticultural staff tours as well as the self touring cell phone experience with its new E.H. 'Chinese' Wilson plant trail. Light refreshments will be available. Admission $5 per car.